California-based drone manufacturer Matternet made headlines last week with an announcement about a drone delivery service. As the company’s CEO tells us, this was a day that was years in the making. Last Tuesday, Matternet announced it is partnering with UPS to deliver medical supplies to a hospital in Raleigh, North Carolina. The announcement came several years after the company had already been testing similar concepts in Switzerland. Matternet CEO Andreas Raptopoulos said the company was founded on the concept of a network of small drones transporting lightweight payloads. The company’s name plays off that concept: a network for matter. “Very early on, we thought that it makes sense to start from applications where you can really make a difference and you can have a lot of impact, and medical we believe is the application to be able to do that," Raptopoulos said. After the company was founded in 2011, it began testing its platform in cities in Switzerland in 2015 to showcase the ability to fly in congested airspace and densely-populated areas. Matternet’s vision was that hospitals could use this technology to more efficiently transport goods than the ground transportation systems that were in place. The flights in Switzerland helped Matternet pave the way for starting similar operations in the United States. Matternet was able to get permission to fly over people and beyond visual line of sight in Switzerland, but those challenges still remain with operations in the United States. Raptopoulos says regulations in the U.S. are trending toward companies like Matternet being able to fly over people and beyond visual line of sight. Raptopolous notes that the Federal Aviation Administration’s Integration Pilot Program has been instrumental in the loosening of some drone regulations. Matternet’s partnership with UPS involves transporting medical supplies to the WakeMed hospital in Raleigh. The initial flight was one-third of a mile and transported blood samples from a surgery center to the main hospital facility. That delivery takes anywhere from 30 to 60 minutes by ground, Raptopoulos said. With the Matternet drone, it takes just three minutes. The drone used for the operation is Matternet’s M2 drone, which Raptopoulos says has a flight time of about 25 minutes and can carry 4 and a half pounds of payload. Also of note is the parachute on board the drone, which deploys if something goes wrong during the flight. 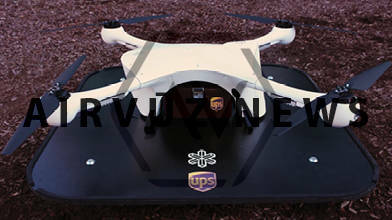 Last week’s announcement was a step in the right direction for drone delivery in the U.S. Matternet hopes the technology and regulations will continue to evolve together in order to make drone delivery an even more viable offering in the future. Tyler Mason is a writer and the host of "The Drone Dish" on AirVuz.com. As a Part 107 certified pilot, Tyler flies drones (DJI Phantom 4) commercially. He also enjoys flying Tiny Whoop FPV drones for fun.